@TheOfficialSBI sent me this update through twitter today. Therefore it can be concluded that @SBIConnex was some fake twitter handle managed by someone! Everyone here might agree if I say Indian PSU brands do not know how to leverage the power of social media. The latest entrant in the block is SBI, India's largest bank. SBI had joined twitter way back in March 2010 (as @SBIConnex) and now they have rejoined under a new name (@TheOfficialSBI). Recently I made a detailed post at TelecomTALK on BSNL's twitter presence. Both SBI and BSNL have done the same mistake. Despite of having a large number of followers for their older accounts, they decided to build a new presence from scratch! This is nothing but an overhead according to me. 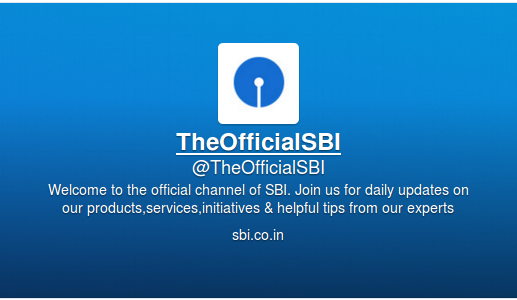 Like BSNL, even SBI failed to place a link on their homepage to the twitter presence. Now when neither SBI nor BSNL has verified accounts from twitter, how does a customer trust or find the twitter handle when not linked through home page. BSNL updated their page after TelecomTALK post!